Skiing down Power Line on the North Ridge Triple. 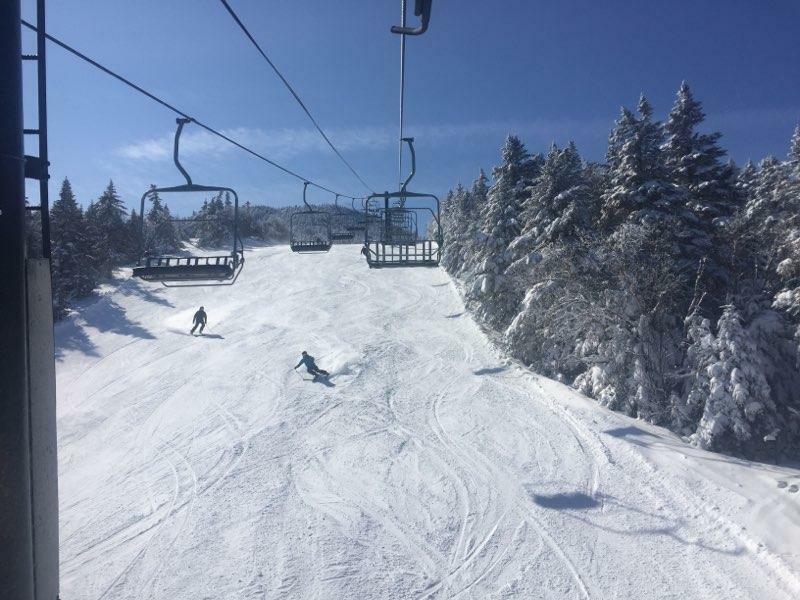 By Mike Roth – A couple weeks ago I had the opportunity to go to both Magic Mountain and Killington, two entirely different ski areas with both offering their own great skiing. That Wednesday at Magic Mountain was cold but the sun was shining. There was little to no wind yet only the Red Lift was running to the top. Even so, it gives you 1450 feet of vertical on a 5400 ft. long lift. Magic is still running fixed grip lifts so it takes you 12 minutes to make it to the top. The big advantage this ride gives guys my age is recuperation time. My body can ski well into the afternoon. There were wonderfully groomed packed powder trails along with many trails that were left ungroomed and tracked up from a powder day two days prior. They were very good to ski as well. The new bubble six-pack on Snowden Mountain at Killington. The following Friday was a busy day at Killington, or at least it appeared to be as we went into the K1 lodge. There was a long line at the ticket window and the wind was blowing pretty hard. There was also a long line at the gondola. It was a blustery day so everyone wanted to take the gondola to the top instead of riding the open lifts. In fact, that was all you could take since the other lifts were not running. On our first lift ride up it took a while just to get on the lift. It was actually the longest lift line I have experienced all season. Granted, much of my skiing is mid-week but even weekends the lift lines are really not bad due to the number of high-speed lifts on the mountain. Once up on the mountain the world of skiing changed. The sun was out, the wind was less and the surface was beautiful packed powder. It wasn’t a 10 (which is a powder day) but it certainly was a 9, just as it was at Magic two days earlier. In addition, the winds died down and additional lifts opened up. “The Beast” was in its full glory. Conditions were consistently good no matter where you were on the mountain.Killington is so large we only skied the left side of the area, that being Killington Peak, the Northridge triple (the old cascade chair) and Snowden Mountain with its new bubble six pack, and Ramshead. There was no need to go to other areas of Killington since we had more than enough to ski where we were. New tunnel on Snowden Mountain. There were many changes at Killington over this past year. 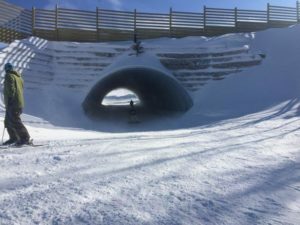 On Snowden Mountain, in addition to the Bubble Six Pack I mentioned before, Killington has built two tunnels at the intersections of a couple of the crisscross trails where collisions can take place. What a difference it makes. In the past we have gone to lunch at the Peak Lodge, a very much desired restaurant with great views and great food but . . . it usually is crowded even on week days. We opted to eat at the base of Snowshed in the Longtrail Pub. The wait staff provided great service. The food choices varied and there were no seating issues as up on top. After lunch, the Ramshead chair was just across the street, making it easy to get to the Snowden Six Pack for four runs before our legs had had it. We had probably skied 15,000 feet of vertical that day and quit by 2:30. Others in our group racked up 33,000 in vertical. Guess they used only high-speed lifts and only stopped while sitting on the chair. Whether you are skiing Killington or Magic, you can only ski one trail and ride one lift at a time. How much can you ski during one day? You don’t always have to ski the “big” ones, although they are nice to go to once in a while, but don’t discount the smaller areas. They both have lots to offer.